The increasing demand for industrial robots across different regions and applications is expected to lead to positive growth in this market during the forecast period. Gantry/cartesian robots are large systems designed for pick and place applications in any workplace. It contains a manipulator mounted onto an overhead system that moves across a horizontal plane. Gantry robots are easier to program with respect to motion, because they work with an X, Y, Z coordinate system. Another advantage is that they are less limited by floor space constraints. The Gantry/cartesian robot market is projected to expand at a CAGR of 13.4% during the forecast period and reach US$ 23,384.4 Mn by 2026. 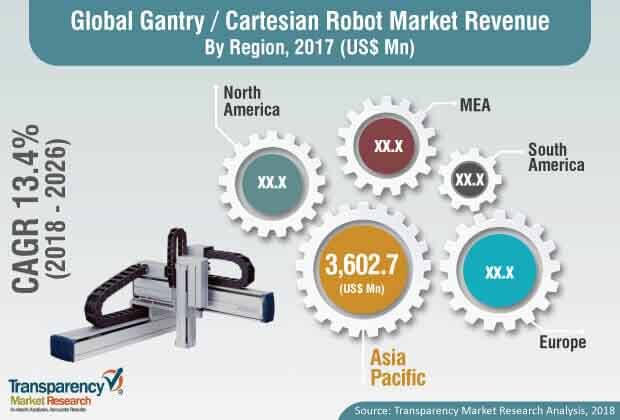 The global gantry/cartesian robot market is driven by an increase in use of automation in a wide variety of applications in manufacturing, electrical & electronics, and othersectors. Furthermore, significant adoption of gantry/cartesian robots in the automotive sector is expected to impact the global gantry/cartesian market. These are quick and accurate solutions for material handling applications. The utmost precision offered by gantry/cartesian robots, coupled with highly accurate link-and-gear combinations is a major factor driving the market in the materials handling application.Moreover with introduction of Industrial Internet of Things (IoT), majority of manufacturers are focusing on equipping their factories with automated systems, particularly in developed countries. Gantry robots saves a tremendous amount of labor and associated costs while also greatly accelerating the production process for end-use industries and this is the main factor that is expected to boost the demand for gantry robots during the forecast period. However, the high cost associated with gantry/cartesian robots is estimated to hamper the global gantry/cartesian robots market. Furthermore, efforts are underway in many companies to upgrade their research and development activities which are expected to generate profitable growth opportunities for the market during the forecast period. The global gantry/cartesian robot market has been segmented based on axis type, end-use industry, and region. Based on axis type, the market has been classified into 1-Axis, 2-Axis, 3-Axis, and 4-Axis. 3-Axis gantry robot provides an easy to specify, cost effective X-Y-Z handling system. It helps to move almost any length, and is scalable and suitable for light to heavy / hanging loads. The 3-axis segment is expected to hold a significant market share during the forecast period due to these benefits.The addition of one more axis (Z-axis) for rotatory motion in 3-axis gantry/Cartesian robot is expected to be a huge potential in new applications during the forecast period.In terms of end-use industry, the global gantry/cartesian robot market has been segmented into automotive, manufacturing, electrical & electronics, food & beverages, pharmaceuticals, among other industries. Gantry/cartesian robots within the electrical & electronics segment is anticipated to grow at a significant CAGR of above 14% during the forecast period. In terms of geography, the global gantry/cartesian robot market has been classified into North America, Europe, Asia Pacific, Middle East & Africa, and South America. Asia Pacific is anticipated to hold a significant share of the market over the forecast period followed by Europe and North America. Further, the market in Asia Pacific is anticipated to grow at a significant pace in the near future in emerging countries such as India, China, South Korea, and other countries. Attracted by this expanding market and underlying latent demand, several players are expanding their business through new product development and strategic mergers and acquisitions and partnerships with several industries. Some of the prominent players identified in the gantry/Cartesian market include Güdel Group AG, Aerotech Inc., Bosch Rexroth AG, Ltd, ABB Ltd., Toshiba Machine Co.,Ltd., YAMAHA Robotics, STON ROBOT, Denso Corporation, and IAI America, Inc.